This product requires the base game Omerta: City of Gangsters. It’s a story from a time when love was more important than keeping your cool. In “The Japanese Incentive” add-on, experience an all-new campaign and enjoy a wealth of gameplay improvements. Take on a challenging new AI and set Atlantic City on fire with this brand new expansion for Omerta – City of Gangsters that includes lethal new weapons, expansive maps, engaging characters and more. 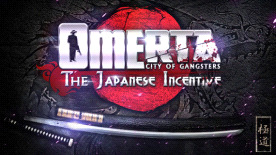 Omerta: City of Gangsters is required to play this DLC.